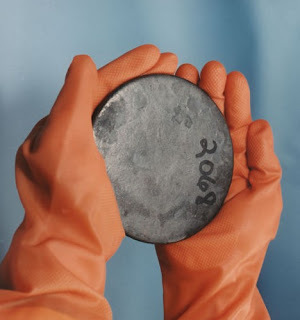 Uranium is a heavy, lustrous, silvery-white metal, capable of taking a high polish. It occurs in many isotopes and is used for nuclear fuels and nuclear weapons. Uranium is the heaviest naturally occurring element on earth. It was first discovered in 1789 by Martin Klaproth, a German chemist, who isolated an oxide of uranium while analyzing pitchblende samples from the Joachimsal silver mines in the former Kingdom of Bohemia located in the present day Czech Republic. Uranium was named after the planet Uranus, discovered only eight years earlier in 1791. Uranium is quite a common element, is 40 times more naturally abundant than silver. A uranium-238 atom has 92 protons and 146 neutrons in its nucleus. Uranium is of great importance as a nuclear fuel. Nuclear fuels are used to generate electrical power, to make isotopes, and to make weapons. This is because uranium is radioactive. However, it took until 1938 to discover that uranium could be split to release energy, that is fission. This was accomplished by Otto Hahn and Fritz Strassman. In fact, one tonne of natural uranium can produce more than 40 million kilowatt-hours of electricity. This is equivalent to burning 16,000 tonnes of coal or 80,000 barrels of oil. There are currently 104 operating U.S. nuclear power plants that produce over 20 percent of U.S. electricity.